The all-new QX50 is a premium mid-size SUV with world-first technologies, stand-out design and enhanced interior space – on an entirely new platform. The aerodynamically efficient exterior remains true to that of the QX50 Concept and QX Sport Inspiration, bringing a fresh interpretation of INFINITI’s distinctive ‘Powerful Elegance’ design language to the SUV segment. Combining a confident SUV stance with intelligent packaging, and deep character lines with INFINITI signature design cues, the appearance of the QX50 highlights the influence of human artistry in the design process to emphasize the car’s premium quality. The unrivaled interior space, artistic application of high quality materials, and advanced craftsmanship make the cabin as welcoming and comfortable as it is flexible. Driver-centric, yet passenger-minded, the QX50 offers a package of technologies to enhance the driving experience, while a calm, connected and relaxing cabin features an asymmetric layout – designed to meet different needs of the driver and the passengers. The car’s VC-Turbo engine, the world’s first in production variable compression ratio engine, delivers driving pleasure and efficiency in equal measure, transforming on demand. Developed on an entirely new platform, the car features the sophisticated and assured INFINITI Intelligent All-Wheel Drive. The QX50's ProPILOT Assist technologies react discreetly and autonomously to certain driving situations, supporting the driver with a range of empowering ‘co-pilot’ features, placing them in total control. “The new QX50 is the most compelling INFINITI to date - a powerful and elegant SUV, with advanced technology providing versatility, efficiency and performance. At an overall height of 1,679mm, the volume of the QX50’s body creates a striking presence and helps the vehicle stand out on the road. The elevated driver position maximises visibility, with an eye-point 1,287mm in height affording a clear view whether driving or parking. The unique bonnet shape facilitates enhanced cabin proportions. A newly developed hinge system, Pop-Up 4 Link Hinge, has been created especially for the QX50, allowing deep, sharp-edged character lines to flow from the bonnet along the body. Integrating the A-pillar into this shape also makes the bonnet appear longer. Character lines are formed by sharp, rolled-edge creases in the bodywork, achieved with INFINITI’s own deep-sculpting manufacturing methods. The clamshell bonnet flows into the character lines running along the side of the vehicle, creating an angle sharper than most competitors, and providing the QX50 with a distinctive visual signature. Aerodynamic efficiency is key to the QX50’s design – the drag coefficient is improved by 6% compared to the previous-generation QX50. Its bonnet, A-pillar, tailgate and enclosed under-body are all specially designed to encourage airflow over, around and under the vehicle, with minimal turbulence. The bumpers and wheel arches feature air slits, inlets and outlets to assist the efficient flow of air. Meanwhile, the centre of the QX50’s roof is subtly recessed towards the rear of the car, and the side spoiler (connecting the sides of the rear spoiler to the rear screen) and a defined trailing edge to the rear combination lamps each contribute towards a zero lift design, encouraging the expulsion of air ‘tumbling down’ from the top of the car when in motion. INFINITI’s approach to aerodynamic efficiency aids stability and maximises fuel efficiency. A wide range of colors allow for a high degree of personal expression. Exterior paint finishes available in every market include: Majestic White, Liquid Platinum, Graphite Shadow, Eclipse Black, and Chestnut Bronze. Other colors are available in specific regions. North American buyers can choose from Dynamic Sunstone Red, Hermosa Blue, Lunar White, and Black Obsidian; Midnight Garnet and Iridium Blue are available in China. INFINITI’s signature crescent-cut D-pillar extends the visual length of the roof line, and the rear pillar arcs forward, emphasising motion even when the car is stationary – demonstrating INFINITI’s commitment to bringing distinctive design to life. INFINITI’s VC-Turbo engine is the world’s first in production variable compression ratio engine – and it makes its debut on the new QX50. 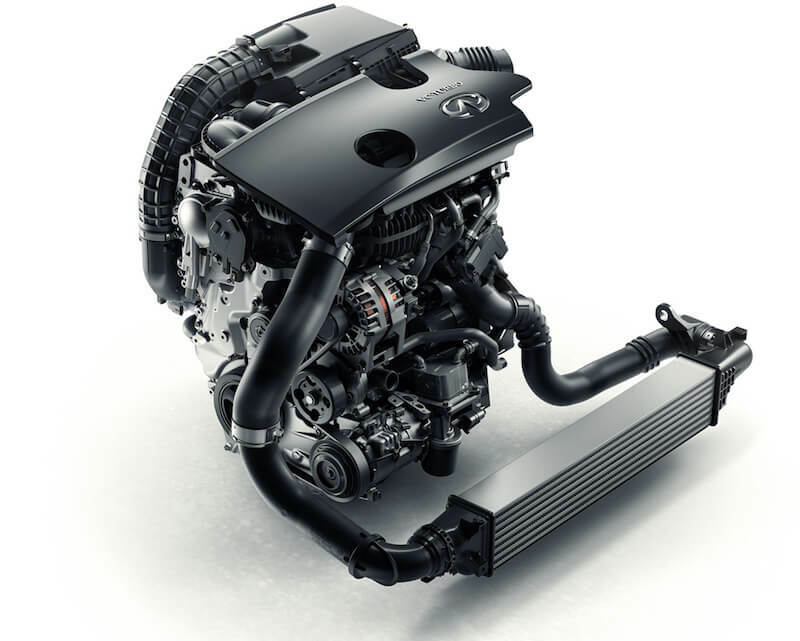 This unique variable compression technology represents a breakthrough in combustion engine design – the QX50’s 2.0-litre VC-Turbo continually transforms, adjusting its compression ratio to optimizes power and fuel efficiency. It combines the power of a 2.0-litre turbocharged gasoline engine with the torque and efficiency of an advanced four-cylinder diesel engine. Other highlights include compact packaging and weight-saving technologies. The engine block and cylinder head are cast in lightweight aluminum alloy, while the transformative multi-link components are manufactured in high-carbon steel alloy. Compared to INFINITI’s 3.5-litre VQ V6 engine, the 2.0-litre VC-Turbo weighs 18kg less and requires less space in the engine bay. The engine employs the world’s first multi-link system and an electric motor with a unique Harmonic Drive reduction gear to transform its compression ratio. The electric motor is connected to the Harmonic Drive with a control arm; as the Harmonic Drive rotates, the control shaft at the base of the engine rotates, moving the multi-link system within the engine. As the angle of the multi-link arms changes, it adjusts the top-dead-centre position of the pistons – and the compression ratio with them. An eccentric control shaft changes the compression ratio of all the cylinders at the same time. As a result, the engine capacity varies between 1,997 cc (for a low 8:1 ratio) and 1,970 cc (high 14:1 ratio). Under the Atkinson cycle, air and fuel intakes overlap, allowing the fuel in the combustion chamber to expand to larger volumes for greater efficiency. The INFINITI engine operates the Atkinson cycle under higher compression ratios, with longer piston strokes allowing the intake valves to open for a short time as the compression stroke starts. The Atkinson cycle is commonly used in hybrid engines to maximise efficiency. An integrated exhaust manifold is built into the aluminium cylinder head to further enhance packaging and efficiency. This enables INFINITI engineers to position the catalytic converter next to the turbo, creating a shorter flow path for hot exhaust gases. This means the emissions control process can start sooner, as the catalytic converter heats up more quickly. Closely controlling the flow of exhaust gases through the turbocharger, an electronically-controlled wastegate actuator maintains turbocharger boost pressure. This ensures high fuel efficiency and performance under all conditions while minimising emissions. The uncommonly smooth VC-Turbo does away with the two balance shafts required in conventional four-cylinder engines, due to the layout of its multi-link system (see below). The VC-Turbo is also smoother than conventional in-line engines, and has the low noise and vibration levels expected of a traditional V6. This is, in part, a result of its multi-link design, where the piston connecting rods are almost vertical during the combustion cycle (rather than moving wider laterally, as they would in a traditional crankshaft rotation). This represents the ideal reciprocating motion, and entirely negates the need for balance shafts. Despite the addition of a multi-link layout, the engine is therefore as compact as a conventional 2.0-litre four-cylinder engine. The QX50’s 2.0-litre VC-Turbo engine employs the world’s first active engine mount vibration damping system, called an Active Torque Rod (ATR), to reduce engine noise even further. The QX50 is the only car in its class to offer this kind of technology. Integrated into the upper engine mount, where the most high-torque noise and engine vibration is generated, the ATR has a G-sensor that detects vibrations. It then creates opposite, reciprocating vibrations, enabling the four-cylinder engine to be as smooth and quiet as a V6, reducing engine noise by 9dB (compared to the current QX50). This helps to make VC-Turbo one of the quietest and smoothest engines in the premium SUV segment. The XTRONIC CVT reacts instantly to driver inputs, with an infinite number of gears matched to the transformation of the engine through different compression ratios. The transmission adjusts immediately under hard acceleration as the engine transforms to a lower compression ratio. A higher gearing ratio for cruising speeds matches the higher compression ratio of the engine, enhancing fuel efficiency. A high final gear ratio (5.846) creates an instantaneous and decisive acceleration character – empowering the driver to accelerate more urgently when desired. The suite of autonomous drive support technologies in the QX50 is called ProPILOT Assist, which, as a package, helps the driver control acceleration, braking and steering during single-lane highway driving. Equipped for the first time in an INFINITI model, ProPILOT Assist effectively reduces the stress of stop-and-go driving and highway cruises. Acting as the driver’s ‘co-pilot’, ProPILOT Assist takes over single-lane driving operation at the push of a button, without the driver’s input on acceleration, braking, or steering. The driver can choose to let the car operate on their behalf in stop-start traffic. The technologies that make up the full suite of QX50’s ProPILOT Assist system include Direct Adaptive Steering and Intelligent Cruise Control. These are supported by additional technologies, including: Distance Control Assist; Back-up Collision Intervention; Predictive Forward Collision Warning; Blind Spot Warning and Intervention; Lane Departure Warning and Prevention; and Forward Emergency Braking with pedestrian detection. Other notable safety features available to QX50 buyers include pre-crash seat belt technology, adaptive front lighting with high beam assist, a tyre inflation indicator, and lighter steering for certain parking situations. The QX50 features a fourth-generation version of INFINITI’s Direct Adaptive Steering (DAS) - the first SUV and first front-wheel drive application of the system. DAS is a steer-by-wire system that supports autonomous driving by providing smooth operation, allowing for more direct steering responses and easy manoeuvrability. DAS is an enabler to steering systems that will form a key building block on the way to achieving comprehensive autonomous drive functionality. The ‘steer-by-wire’ system eliminates the need for mechanically linked parts, instead employing digital components to improve steering feel and feedback. The connection between the driver and DAS is instantaneous, thanks to the electronic connection between components. The INFINITI QX50 connects users to the car with its InTouch infotainment system. InTouch allows the driver to access vehicle comfort and entertainment settings via dual screens at the centre of the instrument panel. Upon entering the car, the QX50 will recognise the driver and remember a range of settings via profiles saved in the car’s Intelligent Key. For example, the system automatically reverts to pre-set seat, mirror and steering wheel positions, according to recorded driver preference. InTouch also recalls entertainment options and the preferred layout of on-screen displays, along with the most recent Drive Mode Selections – all adding to the sense of personalisation within the car. Users can interact intuitively with InTouch, either through the dual touchscreen displays or through the INFINITI Controller, a dial on the centre armrest. Occupants can also connect to InTouch via a hand-held device, meaning passengers can stream media from smartphones, tablets, MP3 players and notebooks, connecting devices with one of the four USB ports, or via Bluetooth for wireless music streaming and voice calls. Video can also be connected and played back, and InTouch can synchronise with a phone’s digital calendar. In certain markets, the InTouch system is compatible with telematics features, such as ‘remote start’ and ‘locate vehicle’. 0-inch upper touchscreen in the centre console, displaying essential information to the driver, including navigation instructions and system messages. Displaying this information on the upper screen enables the driver to focus their attention on the road ahead more readily. The QX50’s body-mass index (the bodyshell’s ratio of weight-to-size) is one of the best in the segment. The body-in-white is large but lightweight, weighing just 419 kg (923.7 lbs). A double-ring structure provides the bodyshell with a naturally strong frame, in particular reinforcing the rear of the car and the area around the tailgate, contributing to segment-leading rigidity. The QX50 represents the first automotive use of SHF (Super High Formability) 980 MPa high-tensile steel, further strengthening the all-new platform. The high-tensile material can be moulded into unprecedented shapes, saving weight and representing a torsional rigidity improvement of 23% over the current QX50. This segment-leading rigidity allows the car to resist flex and vibrations, while reducing the noise transmitted to the cabin. The unique, confident SUV design and associated interior roominess are facilitated by space savings within the engine bay. The QX50’s revolutionary and highly compact 2.0-litre VC-Turbo engine with a single-turbo layout occupies below-average space in the engine bay (see ‘Engine’ section for details). The body is designed in such a way as to accommodate both front-wheel drive and all-wheel drive drivetrains without impacting cabin space. Another element of the powertrain also enhances cabin space: the QX50’s ‘shift-by-wire’ electronic transmission differs from a typical transmission linkage as it requires no bulky mechanical components in the cabin. This enables a more efficient centre console layout and results in the creation of a larger console storage compartment – it has been designed to accommodate large electronic tablet devices. The interior space is made more flexible with its sliding rear bench. The cargo area is 990mm deep with the rear bench all the way back – increasing to 1,140 mm with the seats moved forward. The trunk’s volume is 31.6 cu ft (895 litres SAE), with the rear seats in their rear-most position, expanding to 37 cu ft (1,048 litres SAE) with the rear seats set forward. The trunk grows to 60 cu ft (1,699 litres SAE) with the rear seats folded down. As one of few vehicles in its segment to offer sliding second-row seats, the QX50 boasts best-in-class rear legroom of up to 838mm – sufficient to let rear passengers cross their legs in comfort. The trunk accommodates three golf bags, or a cart situated length-wise, with space for additional cargo. Hidden under-floor storage compartments can be used to stow valuable items, or wet and muddy clothing. Storage options are improved over the previous-generation QX50, with front storage compartments located at the bottom of the centre console capable of holding two smartphones and a wallet. The cup holder is larger, capable of accommodating two 32oz cups, and door storage areas can hold a 1.5-litre bottle and an A6 notebook, or a small handbag. In designing the asymmetric interior of the QX50, INFINITI has maintained a driver-centric, passenger-minded approach to the cabin layout and in-car technologies available. Incorporating technologies which enhance the potential for relaxation and calm, the cabin provides an environment suited to the needs of driver and passengers alike. An Around View Monitor (AVM) offers a 360-degree overhead view of the space around the QX50, displayed on the centre console screen, to aid parking in tight spaces. Moving Object Detection (MOD) works in tandem with AVM to alert the driver of people or objects that move into proximity of the vehicle. When in reverse, the system automatically applies the brakes if it senses the driver has not taken action. In addition to the birds-eye view, AVM also offers drivers a ‘curb-level’ view, to reduce the risk of scratching the wheels or fenders on a high curb. Four parking sensors in each of the front and rear bumpers (eight in total) make the QX50 even easier to park. The climate control function in the new QX50 is designed to benefit all passengers, and not just those in the front of the car. Dual-zone climate control automatically maintains the cabin temperature for driver and front passenger, while a more passenger-minded optional tri-zone automatic climate control extends temperature functions to the rear. Front seat occupants can adjust fan, air conditioning and vent settings to maintain a constant, comfortable cabin temperature, while passengers in the rear can alter temperature settings. Heated and ventilated seats in the front, as well as a heated steering wheel, are also available. A Remote Engine Start System with Intelligent Climate Control allows the driver to start the engine remotely with the Intelligent Key, and to cool or heat the cabin before they get in. The QX50’s optional Bose Performance Series audio system is designed to replicate the rich sound of a live music performance. The 16-speaker system is tuned specifically for the QX50’s interior acoustics, and the hardware underpinning the system includes an amplifier, a high-quality sound processor, tweeter speakers and a subwoofer. The Bose Performance Series delivers deep, rich and nuanced sound to the driver and all passengers – while the depth of sound provided by the 16 speakers delivers clear, natural-sounding low and high frequencies. A microphone is fitted in the cabin to monitor ongoing interior noise, and the Bose system calculates how to adjust audio output according to cabin noise conditions. Advanced Staging Technology uses the speakers and a signal processor to help create a wider sound stage in the front of the car, providing a precise, consistent and tailored aural experience – the system can even emulate the sound of standing in the front row at a live performance. The QX50’s new platform, with segment-leading rigidity, enables the car to resist flex and vibration, and allows the front and rear suspension, steering and brake components to perform at their best. An all-new MacPherson Strut front suspension system delivers immediate responses during spirited driving, with geometry set up to also provide high levels of straight-line stability and ride sophistication. Early suspension prototype components were modeled and validated with 3-D printing, the first time INFINITI has used the technology. 3-D printing enabled the rapid creation of new parts, reducing the complexity of development. The QX50’s new damping control system maximizes body control and ensures a comfortable ride by isolating vibrations and reducing unwanted body motions. The system, fitted to the struts, uses a floating valve in the dampers. It is tuned to provide greater control and reduce the level of elasticity in driver inputs – the ‘lurching’ delay between the driver turning the wheel and the car reacting – while enabling a greater degree of compliance and shock absorption at wheel level. Under cornering, the valve adds greater damping force to reduce body roll and aid immediate handling responses. At steady straight-line speeds, a reduced level of damping force aids cruising comfort. The QX50’s wheels are fitted with new run-flat tyres, striking a balance between design, practicality and refinement. The application of run-flats enables the fitment of low-profile tyres around the 20-inch wheels, while special reinforced rubber sidewalls allow the tyres to work with reduced air pressure for up to 93 miles (150 km). This gives owners the peace of mind that they can drive to a tyre fitter to replace a punctured wheel, and eliminates the need to carry a spare tyre, freeing up additional trunk capacity. The QX50 offers two adaptive steering systems: Direct Adaptive Steering (DAS) and rack- electric power steering (Rack EPS). DAS is the world’s only digital steering system, and the fourth generation features updated software for the QX50 – the first SUV and first front-wheel drive application of the system. DAS replaces a mechanical steering column with high-speed electric motors and sensors, with the steering instead controlled and enhanced digitally. The system places the driver in total command, and is key in realising the QX50’s ProPILOT Assist functions. The DAS system has been tuned to provide greater customization in the QX50, with less negative steering and road surface feedback. DAS is programmed to provide smooth steering and more direct responses, while enabling easy maneuverability. DAS eliminates the need for mechanical parts, instead employing digital components to improve feel and feedback. The electronic connection gives the driver instantaneous steering responses, for a linear and secure driving experience. The D allows the driver to select the driving mode that best suits their preferences and present road conditions. Empowering the driver to customize their driving experience, DMS adjusts engine torque output, transmission shift points, steering ratios and steering effort in each mode. In every model, drivers can choose from four different driving modes: Standard, ECO, Sport, and Personal. The QX50 features a pair of active sound control technologies: Active Noise Cancellation (ANC) and Active Sound Enhancement (ASE). ANC reduces noise to give the QX50 one of the quietest cabins in its class. It uses two microphones to identify undesirable low-frequency engine noise (‘booming’), then neutralises it by playing opposing sound waves through the door speakers. This creates a relaxing, refined atmosphere that enables and encourages conversation among occupants – or lets them listen to music more clearly. The new VC-Turbo engine was a particular focus for testing teams, following the unit’s 20-year development process. INFINITI has worked on the unique multi-link technology since 1998 to validate reliability, testing more than 200 physical engine prototypes. This has included over 30,000 hours on test beds – equal to 5,000,000 kilometres of testing and development – and 3,000,000 kilometres of equivalent road testing. Testing of INFINITI’s new engine has also included verification at the hands of the Renault Sport Formula One team. INFINITI drew on the motorsport team’s expertise in material dynamic motion analysis to validate reliability under extreme conditions. Gear ratios (manual shift mode & CVT drive range) – replicates 8-speed transmission. QX50 has not been homologated under the European test cycle yet.